Israel has confirmed the attack last night on an advanced weapons storage facility of Hezbollah. AL JAZEERA: Activists and residents in Damascus have reported large explosions originating from Qasioun Mountain, a strategic military position for the forces of Bashar al-Assad. Sources have told Al Jazeera that an Israeli jet broke the sound barrier and hit several military posts. Al Jazeera cannot independently verify the contents..
YNET: Alleged Israeli attack on Syrian military base wakes local residents, baffles world and pushes rebels to take credit for 'mortar attack' as details remain unclear.. The force of the dawn attack on a Syrian military site outside Damascus on Wednesday shook the ground, waking nearby residents from their slumber with up to a dozen blasts, two sources in the area said.. Details of the strike remain sketchy and, in parts, contradictory. 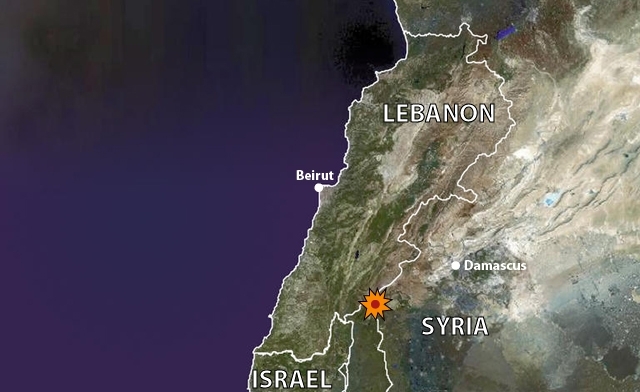 Syria said Israeli warplanes, flying low to avoid detection by radar, crossed into its airspace from Lebanon and struck the Jamraya military research center. YNET: Fighting erupted in Damascus on Sunday near a complex linked to Syria's chemical weapons program, on the third day of an offensive by President Bashar Assad's forces aimed at driving rebels from main sectors of the capital, activists said. In coordination with a major military exercise at Israel's northern border Israeli jets today have targeted a number of positions in Syria (more). Israeli jets have also been spotted over de Bekaa Valley in Lebanon and close to Beirut, where concentrations of Hezbollah are located. Also ground troop movements have been reported from Israel in the direction of Lebanon. Israel has confirmed only one air strike so far: on a convoy of rockets to Hezbollah territory. According to Israeli intelligence sources Israeli troops have crossed the border with Lebanon about 5 to 7 kilometers and have reached the Shebaa farms. They have taken up positions across some thirty Shiite villages in Syria, that are guarded since this week by 6-8,000 Iranian troops of the Basij militia and Hezbollah terror groups. According to the US, Israel has also hit a chemical weapons depot near Damascus. On April 29 Israeli jets have been spotted over the Syrian capital. It is expected that Israel will step up military operations in Lebanon and Syria next week. It will probably not take long before Syria, Iran and Hezbollah will stop all pretense and retaliate.